On Friday afternoon, John McCormick gave a keynote address entitled “Leo Strauss’s Machiavelli and the Querelle between the Few and the Many.” Professor McCormick is Professor of Political Science at the University of Chicago. He is the author of Weimar Thought: A Contested Legacy (Princeton University Press, 2013), Machiavellian Democracy (Cambridge University Press, 2011), and Weber, Habermas and Transformations of the European State (Cambridge University Press, 2006). 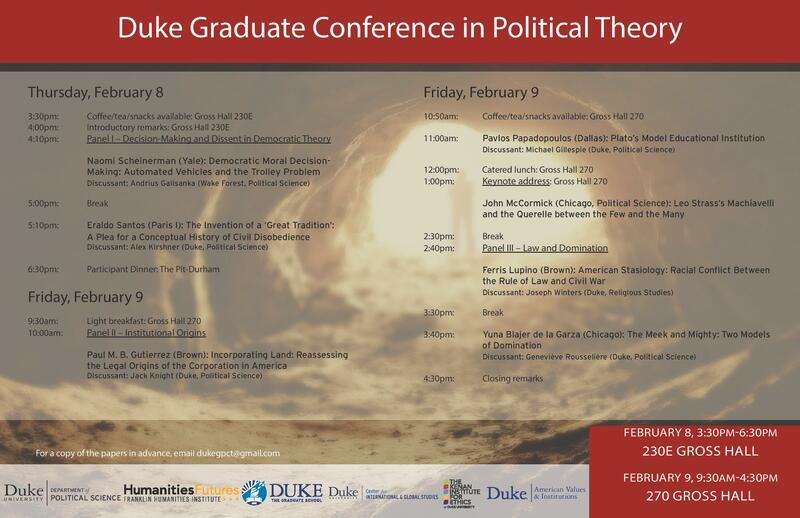 In addition to AVI, the conference was sponsored by the Duke Graduate School, the Department of Political Science, the Kenan Institute for Ethics, the Center for International and Global Studies, and the Franklin Humanities Institute. Click on the schedule below for an overview of the conference.